Our company is highly specialized in manufacturing precision CNC (which means Computer-numeric controlled) machining of small or complicated parts through heat (hardening, tempering, annealing) and surface treatment. It may sound like a very complicated job but it is very simple to describe it. Mostly we work with machines, sometimes automatic ones which don’t require the constant presence of employees during the process. These machines subtract material from a big block of a certain metal and cut it off until we get the shape of the size we need to make a piece used in machinery. How our products are employed in the market. industry, to communication, aerospace, laser systems, and robotics. Our products represent the strength of our craft and our pride in providing cutting edge quality material for the modern market with the use of our equipment which is the core of our industry. The parts we produce are made to work well under stressed performances, in any condition and to require way less maintenance than the average pieces that our competitors provide, that way they last much longer, for the happiness of our customers. What is CNC turning and how it works? The blocks of metal we work with go through different treatments. The final pieces are cut several times on very fast rotating axis (smaller pieces usually require one axis machines but bigger ones will need more, together with other treatments), usually our employees perform some rough cuts to remove excess material on the piece first, this is because oxidation is common we the metals we handle, and then there some precision cuts to bring the piece to its final shape and to the final polishing process. The process of cutting a piece while it rotates is called CNC turning because it involves the metal to rotate on an axis and to be cut by a blade all around it. CNC turning blades can produce a different kind of shapes on the material and make it straight, conical, curved or grooved depending on the final use it will have. Our finished products are very easy to use, mounting them is also easy and they have a simple design, all the parts on sale are precise in design and precision is what makes us really proud of our work. What materials we work with your Precision CNC Machining Components? Almost all steel products are processed to remove oxidation and modify any imprecision they may have when they first arrive. This, however, is not performed in a single way only. The finishing process changes depending on the material we are working with. Steel and Titanium are different for instance and require also different treatments, but the result is the same. We also perform final plating of all our pieces, which is a process used to cover the finished piece with another material, usually a metal (blackening, anodizing, zinc and chrome plating and phosphate coating) to protect it from early corrosion. However we deal with many materials every month and they can range from the hardest steels (structural steel, stainless steel, tool steel) to light metal alloys (aluminum and titanium alloys), heavy metals (brass, copper, copper alloys, zinc and zinc alloys), polymers and nonferrous metals. Apart CNC turning and there are many other precision processes we perform: CNC Milling is one of them, it can be performed after CNC turning and is used to produce parts which are not axially symmetric and have many features (holes, pockets, and contours). Usually, it is performed used more complicated equipment which includes complex rotation to better reach any corner of the piece. Another use of milling is the refining of parts which were made using a different process since it can offer much higher precision. What is secondary finishing for Precision CNC Machining Components? But our company also offers secondary finishing, which is what we do to pieces to make them ready for the market. 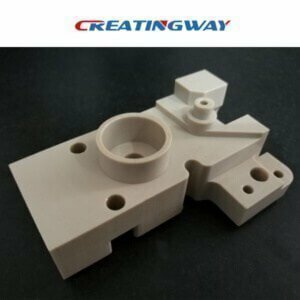 Secondary finishing is performed through other cuts or heat treatment (usually to improve the mechanical and tactile properties of the piece), or even through the use of abrasive sands used to polish the piece in the final stage of production. Another interesting finishing process is electro polishing, which has as a first objective the reduction of the micro roughness of the pieces and since it does not involve chemical or mechanical action, it can be used also for the most delicate pieces we produce.